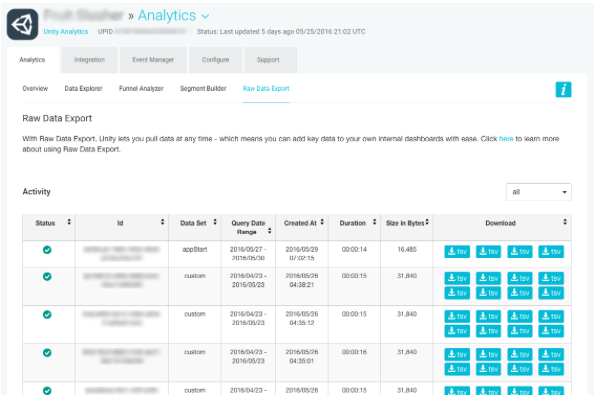 Unity Analytics Raw Data Export gives you full access to raw event data. This lets you use the data in whatever way you choose, for example to construct custom queries or data visualizations. Raw Data Export provides data from June 2016 onwards. See in Glossary > Raw Data Export. 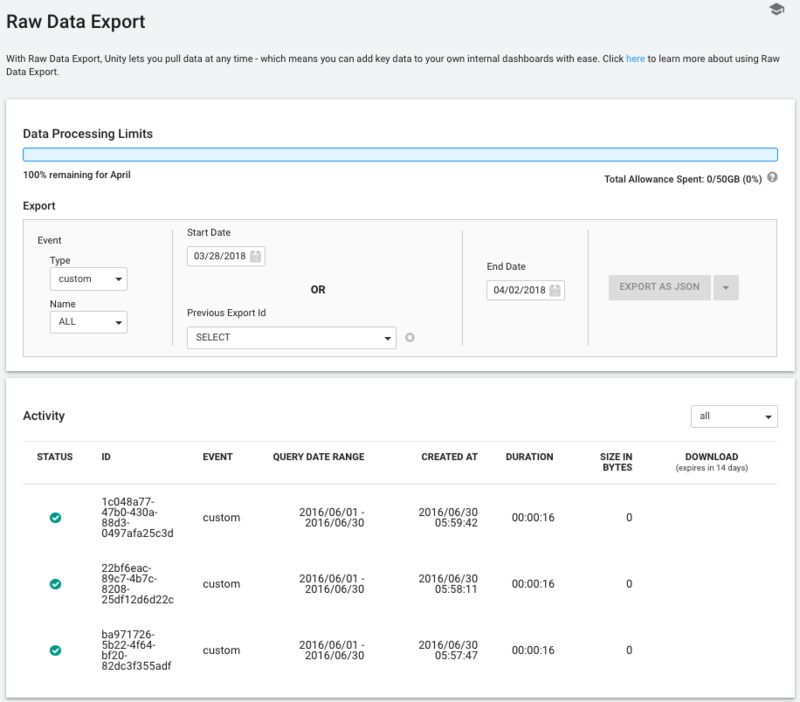 Specify the Data Set you want to export (such as appRunning, appStart, custom, deviceInfo, or transaction). Specify the Start Date, or alternatively continue exporting data from a previous job by selecting the Previous Job Id from the drop-down box. The file format defaults to JSON. Specify your preferred file format by clicking on and selecting an item from the drop-down menu under Export as JSON. Raw Data Export automatically creates the job and displays it in the Activity table on the screen. Once the job is done, you can download your data by selecting the files from the Download column. Every data point sent to Unity Analytics is stored in Unity’s data store. 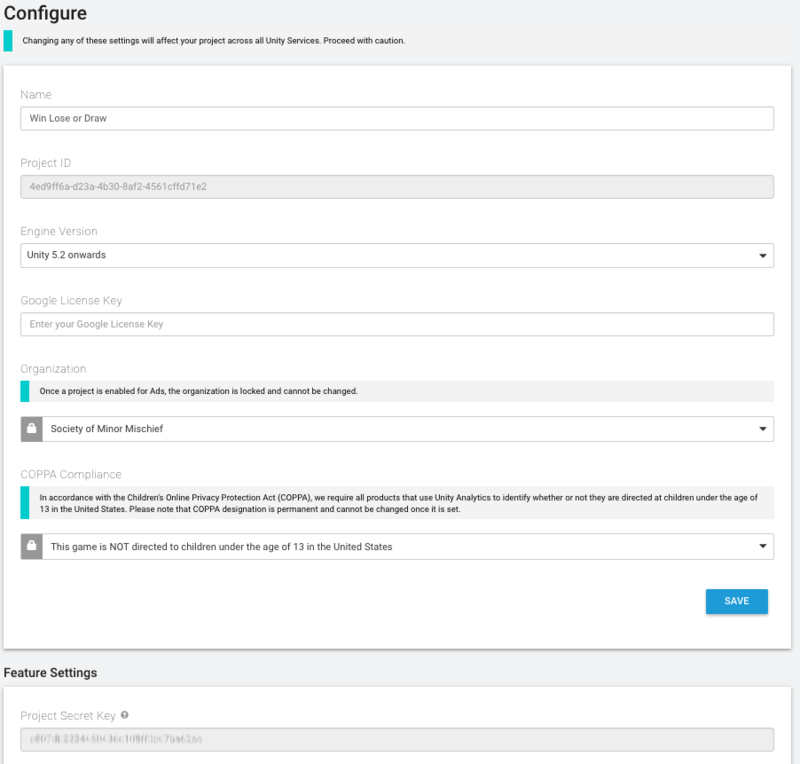 The Raw Data Export APIs allow you to download your raw event data in files as the data is received and stored. Every request requires HTTP Basic authentication using your Unity Project ID (UPID) and API Key. The request period (startDate to endDate) is limited to 31 days. Limits to usage may be subject to change. To export raw data, call the Create Raw Data Export API. This request triggers an asynchronous job to process the data. The time this takes depends on how much data is being exported. To get the current status or result, poll using the Get Raw Data Export API. Once the export is completed, you can get the result in the response of this API. The result contains the list of files and the corresponding download URLs. You can loop through the URLs and download the exported data. All dates and times in requests or responses are in the UTC timezone. API requests or responses use the JSON format (which is formatted for readability in this document). The data file format is configurable. Data is exported in .gzip compressed files. The URL base for the API is https://analytics.cloud.unity3d.com. A Raw Data Export is specific to a project and specific to a single dataset (event type). The request period is limited to 31 days. Arguments are provided in the payload of the request, and are in JSON format with the Content-Type application/json. startDate Required unless continueFrom is specified string The start date (inclusive) of the export. The date is expressed in YYYY-MM-DD format (ISO–8601). endDate Required String The end data (exclusive) of the export. The date is expressed in YYYY-MM-DD format (ISO 8601). This is the date at which to close the query. When searching for the current day, use the following day’s date. format Required String The output data format: json (newline-delimited json) or tsv. dataset Required String One of the following event types: appStart, appRunning, deviceInfo, custom, or transaction. continueFrom Optional String The Raw Data Export ID to continue exporting data from. This is used for continuing a previous export from the point it finished. See Continuing for more information. Instead of specifying a startDate, a prior Raw Data Export ID could be specified in continueFrom. It is an error to specify both continueFrom and startDate. The response uses the common Raw Data Export Response Attributes in JSON format. id String The Raw Data Export ID. upid String The Unity Project ID. createdAt String The created time in ISO 8601 format. status string The current status of the export. Possible values are: running, completed, or failed. duration Long The time it took to export data (in milliseconds). request Json The request arguments. result Json The result contains attributes that detail the exported data. The result is only available after the export is successfully completed. See below for result attributes. result.size Long The total size of the data exported (in bytes). result.eventCount Long The total number of events exported. result.intraDay Boolean When the request includes the current day it might not contain all the data for the day. This attribute is TRUE if the data is incomplete for the last day. result.fileList Json The list of files containing the data exported. The file list is empty when there is no data. result.fileList.name String The file name. result.fileList.url String The download URL for the file. The files are compressed in gzip format. result.fileList.size Long The size of the file in bytes. result.fileList.date String The file contains events for this specific date. This date is based on the submit time of the event. There may be multiple files for the same date. The date in is in ISO 8601 format. When you are running periodic Raw Data Exports, you must provide the continueFrom argument instead of the startDate to make sure you are continuing from the previous Raw Data Export. Prior Raw Data Export IDs can be fetched via the GET APIs or accessed via the Dashboard. All required arguments are part of the URL path. The response is the Raw Data Export in JSON format. It is the same as the response in Create Raw Data Export. The response is a list of Raw Data Exports in JSON format. See Raw Data Export Response Attributes for the definition of each export list element. If you choose to export in TSV format, the headers are provided in a separate file in headers.gz. The data files do not include headers. Each of the six data types (event types) differ. See below for their schema definitions. ts is the timestamp at which the event was generated on the device. Note that device-generated timestamps can be skewed due to the device clock and latency in receiving the event. submit_time is the timestamp at which the event was received by Unity Analytics. If a field in a record has no data, the value of that field is set to the default value for the data type of the field (0 for numbers, "" for strings, and false for bools). Nested fields, like the IAP TransactionEvent.receipt field, in JSON-format exports are an exception to this policy. In the JSON-format export of nested fields, any fields containing no data are not included in the JSON object for that record. 2018–08–01 - Removed remote_ip field. It is no longer available. 2018–06–28 - Removed UserInfo event. 2018–06–04 - Removed deviceid and adsid from DeviceInfo event. Deprecated UserInfo event.